Despite perfectly executing the exact same game plan over his last seven Octagon outings, welterweight champ Georges St-Pierre flipped the script in his win at UFC 124. MMA’s top ground fighter went circa 2006 and repeatedly jabbed Josh Koscheck’s right eye until it looked liked THIS. Although GSP posted another runaway victory, it was once again of the unanimous decision variety. While the reigning king and many of his detractors focused more on his inability to finish than his 25 masterful minutes, St-Pierre’s longtime coach concentrated on Kos’ ability to take a beating. 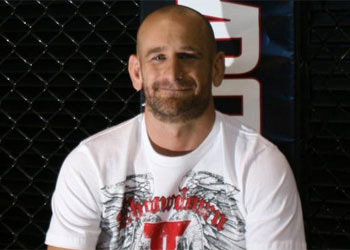 “We tried to finish the fight because that was gonna get us the safest way out, and that’s the truth,” Greg Jackson told Sherdog.com. “So we tried to finish the fight, Koscheck is just not an easily finished person. What you have to understand is, it’s not bums going up against Georges St-Pierre. Prior to notching his fifth consecutive welterweight title defense, fans complained St-Pierre’s game had grown predictable and borderline boring. While his ground attack was the sport’s most dominant, it wasn’t always the most thrilling action pay-per-view purchasers had witnessed. In addition, Jackson recently came under fire from UFC president Dana White for consistently masterminding snoozer game plans and killing MMA with one uneventful unanimous decision after another. While the brash promoter never mentioned GSP by name, the baddest 170-pounder in bare feet took the message to heart and decided to turn back the hands of time. Instead of focusing squarely on ground control, like the 29-year-old had done since getting upset by Matt Serra over three years ago, St-Pierre unleashed a stand-up clinic for the ages. “I thought he did incredibly well. I was really impressed with his kickboxing abilities, his ability to adapt when he couldn’t maintain the takedown,” Jackson added. St-Pierre has posted three straight unanimous decision wins en route to becoming the weight class’ clear-cut G.O.A.T.